You must make reservations at least 5 minutes in advance of the time at Da Mimmo Finest Italian Cuisine. Da Mimmo has a private gated parking lot that can be entered from Albemarle Street. Just press the black button on the call in box and we will let you in. If that parking lot is full, pull around to the front of the restaurant and you will be directed to a second parking lot on the corner of High and Pratt Streets. Da Mimmo can be reached by MTA Bus, the light rail or the subway. Entertainment can be enjoyed nightly live in the Celebrity Cocktail Lounge and heard throughout the entire restaurant. Tuesday through Saturday enjoy the mellow sounds of The Jerry & Elsa Burns Duo. On Sunday and Monday listen to your old favorites, as well as contemporary Italian tunes by Aldo Locco from Calabria, Italy. Reservations accepted for the lounge and dining available at the cocktail tables, as well as, the bar. Great ambiance, the service was great, quick to notice if you needed something or if you had a question. Price was was a little high for the food and really high for the wine. We went there to celebrate our wedding anniversary because we went there some years ago. It was very disappointing. Service was very slow and the restaurant was not crowded. The prices are high and the food not very good. My veal chop was just ok and Da Mimmos is know for that. My wife shrimp was dry and her Caesar salad not good at all. We sat in the downstairs dining room. The waiter attentive and friendly. The food was delicious. We ordered the Caesar salad an the chicken sorrentino with a side of linguine. Both were excellent. The Caesar salad was a bit expensive $11.95 for what was essentially a side salad but it was absolutely delicious. The portion could have been bigger for the price, but it sure tasted good! The entree was superb. Ate every bit of it. Overall a great experience. Will definitely go back soon! Restaurant was suggested by a friend. It was just okay. Very over priced. Food wasn't spectacular. I don't mind paying a lot for a good meal, but this restaurant is not one that I would refer a friend to. Great food and great service as always. This place never fails to impress. Great service, great food and spectacular staff. Old world service and attention! Do yourself favor and eat here, drinks in the bar are worth it too. I come for business three times a year from California and I never miss a visit. All was great. There was a party in the bar, so we were not able to have a drink before dinner which upset me a little. Plus they were very noisey. The food was great and the service was even better. Have been there several times with no regrets ever. We were visiting Baltimore from out of town and visited Da Mimmo based on online reviews. The food was fantastic and the service was great. I would certainly recommend it to any interested in great Italian food in Baltimore and will definitely be going back the next time I'm in town. Must get the Veal Chop - it is actually 2 chops and they are big and delicious! A little pricey but they were the best we've ever had ! The pasta dishes were wonderful as well - overall we were very happy with everything we ordered ! I had a 745 reservation for Valentines Day. we were a few minutes late because we went to their parking lot where you have to buzz in to be let in. no one picked up for a few minutes. we call to let them know we're late and they said it was fine. ended up getting seated at 820. ordered shortly after. 920 comes around and we still have no food. almost two hours after my reservation. not only that, but their menu was actually limited for valentines day and they arbitrarily just jacked up the prices. each entrée was around $5 extra for no reason. Either way, we leave. Grab our coats, the host asked if everything was ok. I said no it's 920, I had a 745 reservation and we didn't get our food so we are leaving. he says 'sorry to hear that' and doesn't even try to keep us there! unreal. honestly it was the worst dining experience of my life...and we didn't even get to dine because we didn't get food! Personally, I was somewhat disappointed in my recent experience. I had to ask about one of my appetizers 3 times. Now, I can appreciate that it was a busy night but, my past experiences with the restaurant was more enjoyable. Eggplant Souffle appetizer was well worth the wait (as expected for a souffle). Seafood Open Face Ravioli appetizer was superb. Known for their Veal Chop and clearly see why. The thin layers of the Veal Saltimbucco were exquisite. The food was superlative albeit a bit on the pricey side. 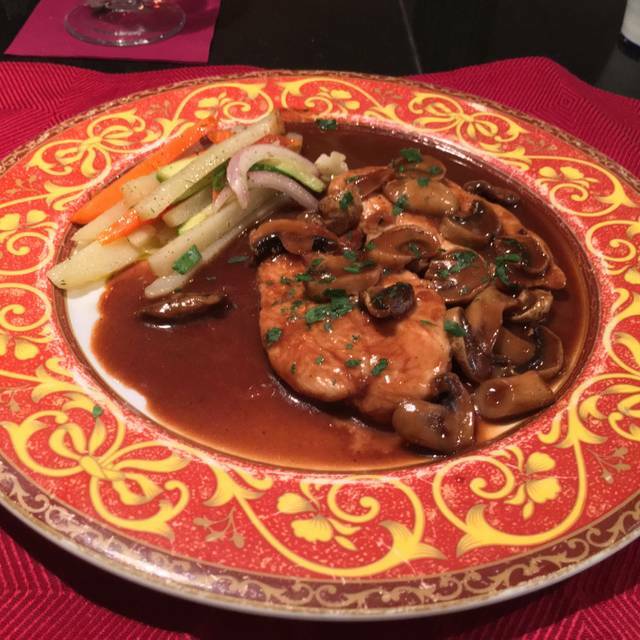 The best Veal marsala I’ve ever had. Great atmosphere and decor. I have dined at many places throughout the US and abroad; Da Mimmo's is possibly one of my very favorites. They are always glad to see you, the attention to service is excellent, the food is authentic and never fails to exceed expectations. MaryAnn and her staff take great pride in their legacy of creating a superior dining experience. If I lived in Baltimore, I'd eat there often. Overly loud and food was only okay and not as good as the last time I was here over a year ago . Dinner at Da Mimmo, alone, is worth the trip for my wife and me from Philadelphia to Baltimore. This time, we were able to introduce dear friends in town from LA to the restaurant. No doubt, they will return next time they are in town. For more than 25 years, we have loved Da Mimmo and return often. I've never been to an Italian restaurant before and was not offered grated cheese or ground peppers to go with my pasta dish when served. That was minor compared to the food itself; I ordered the shrimp scampi and it was awful. The shrimp had no flavor and tasted like rubber. The sauce was ok but the noodles didn't have much taste either and the plate was very small. I would compare my meal to a canned chicken noodle soup with rubber shrimp instead of the chicken. The bread was tiny and could easily be feed to birds in the park. The Calamari was pedestrian. If you like nice atmospheres and not concerned about the quality or value of the food then the place is great. I loved the guest photos in the lounge, the tables, array of the restaurant and the upstairs view of Little Italy. However, I'm just happy I didn't get sick with it being new years eve. I will never go to this restaurant again and am a long time Baltimore resident. I have dined at Da Mimmo's numerous times both business and pleasure. My experience on New Year's eve was an anomaly compared to all of my previous dining experiences at Da Mimmo. My wife and I had a 7:30pm reservation but were not seated until after 8:00pm - I think they forgot we were waiting in the bar. Once seated our waiter was extremely disorganized and unfamiliar with the menu. He served portions of our meal out of order. I made the manager aware of our situation/concerns and he engaged. I later found out that our waiter was actually the shuttle driver and had no experience as a waiter. As normal the food was excellent! I was disappointed this happened at this high-end restaurant. Plus, the manager offered no real apology or any adjustment to the check. Da Mimmo has been around for decades. Although there are more creative and interesting restaurants in town and even in Little Italy, for Baltimoreans the familiar and reliably good Da Mimmo will never go out of style. Pricey, but still good food and good service. My girlfriend and I absolutely loved Da Mimmo. We made reservations on NYE. Upon arriving, we were immediately seated and greeted by the staff. Our waiter was a top notch professional and very attentive. I ordered a Cesar Salad, garlic bread and Chicken Marsala and all were outstanding. Can’t wait to go back! Unable to mix a champagne cocktail at lunch on New Year’s Eve. Out of house specialty veal as well. The place looked closed upon our arrival for a reservation made days in advance. I read today that the place is for sale. I wish the management had just cancelled our reservation since the place was clearly unprepared for the occasion. Phenomenal!! Started in the bar for drinks and then moved into the dinning room. We’ve visited four or five times and this has become our go-to spot in Little Italy. If you haven’t been, just go now. Always love this restaurant. Great food, good service, and availability of free parking is a definite plus. One of our favorite places to dine--and has been for many years. Christmas Eve dinner with family. Wonderful food with excellent service! Always a good experience. I was pleasantly surprised. It was expensive, but I think it was worth every penny. The only negative comment was that there was no toilet paper in the women’s room. The service was excellent, the veal piccata was excellent, the crabmeat appetizer was excellent, etc. the waiter, who turned out to be the owner’s son, was superlative. At this price point a lot of what makes the difference is service, and I cannot say enough about the service. The only reason we drive to the city is for a night in Little Italy and a visit to the family owned Da Mimmo restaurant. The owner and her son can usually be seen greeting guests. The food is the best around. 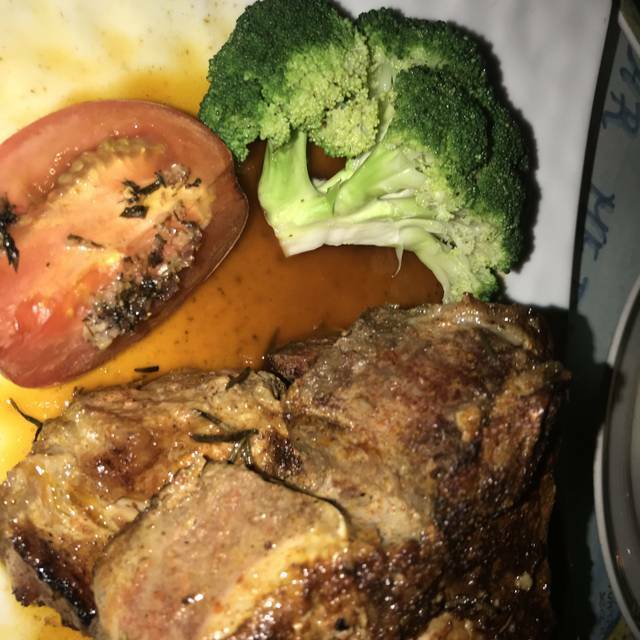 My 15 year old son got a steak and said he was "Lost in the Sauce!" I was shocked he got steak at an Italian restaurant but he swears it is the best he ever had! Personally, I have been going here for over 25 years and always get a veal dish. No place in Baltimore compares. Then ofcourse it's off to Vacarros for dessert! We had a wonderful evening at Da Mimmo's, we enjoyed great food and terrific service! Great food, enjoyed all courses. Even noticed out car lights were on in their park lot and notified us. very attentive service and good wine recommendation. Arrived early and were seated in short order. The Veal Chops are a house specialty for good reason. The ambiance and service along with the remarkable cuisine make it a wonderful dining experience. Da Mimmo's is always a top choice when we visit Baltimore. Private parking lot is a nice convenience. Hands down the best restaurant in Baltimore. I’m gluten-free and the chef always prepares my meal to accommodate me. The staff is always the friendliest and the chef and owner are amazing!! We were seated promptly as we made an early Sunday dinner reservation. Service was good. There were so many specials we had to ask for a repeat. The Chilean sea bass is melt in your mouth incredible although a little pricey. My husband ordered the veal chop which was cooked perfectly and so plentiful we had it the next day for dinner! Everything was wonderful from salads, wine and dinner. Sunday night is half priced wine night from a select list. Excellent food and service. I would have given it 5 stars, except for a slight problem with flies...which surprised us given that it is early November. We will be back, and I would not anticipate finding that problem again. The restaurant section was very crowded and loud but the service and food was outstanding. I had an excellent meal with a few business friends on Friday night. Great overall experience!